Even in the digital age, magazines retain their unique position as one of the most effective and persuasive means of communicating directly and personally with stakeholders at every level. To produce magazines professionally requires unique skill sets, an insider's understanding of the many complex editorial, design and publishing processes, and the ability to translate corporate visions into tangible and compelling communications realities. The English Editors have the expertise, skills and proven experience to manage all aspects of the magazine publishing process effectively and professionally. If your organisation already produces magazines for external or internal stakeholders, or would like to publish one, we can help professionalise every aspect of the many processes involved. Based in the Netherlands, The English Editors have proven expertise in publishing and managing magazines editorially and commercially. Russell Gilbert has served professionally as managing editor and editor in a variety of industry sectors and helped produce magazines for many institutional and corporate organisations. The English Editors would be delighted to discuss our magazine publishing and management services with you and explore how they can work for the benefit of your organisation and its stakeholders. Contact us now! 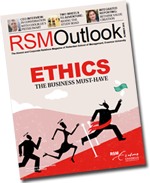 Managing all editorial, design and print processes for RSM Outlook - the corporate and alumni relations magazine of Rotterdam School of Management, Erasmus University. Managing all editorial, design and print processes for RSM Discovery - the management research journal of Rotterdam School of Management, Erasmus University. Managing all editorial, design and print processes for ECSP Insight – the magazine of the Erasmus Centre for Strategic Philanthropy.